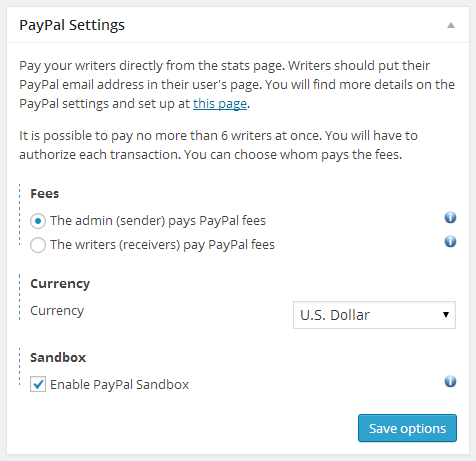 In the Options page, look for the PayPal Settings box. Fees: you can choose whom pays the PayPal fees, either you (sender) or the users (receivers). Currency: define the currency you want your payments to be in. Sandbox: enable the sandbox to test the plugin. Also, in the Permissions box, make sure that the related checkbox is in the wished state. 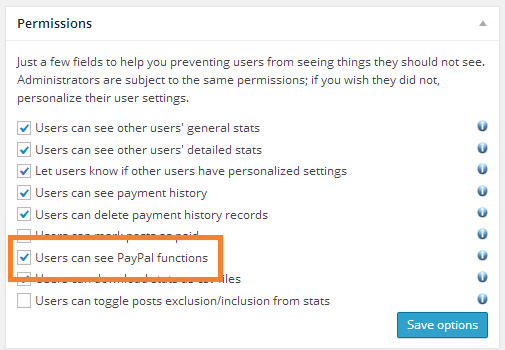 Remember that settings can be personalized: if you want you to be the only person who can see PayPal functions, you should leave the permission unchecked in the general settings and check it for your user. As a side note, you might be interested to know that all payment requests are handled by our website, which forwards them to PayPal. This happens due to not-so-interesting technical reasons, but rest assured that no data is stored on our servers. Also, you may have noticed there is no field to enter the PayPal account do draw funds from. This is because every payment will require you to login into PayPal, so that every transactions needs to be explicitly authorized by you! Now that you have set up all the needed PayPal options, you can have a look at out extensive tutorial on how the payment flow works. See it here! If you can’t get it work and need support, there you go: the support forum is just a click away.